On a flight back from Australia, a woman named Eileen Mackley read an article in the Australian Womans Weekly about a charity, Radio Lollipop, that had just opened in a Perth hospital and thought this might just be a good project for the Red Cross here in Auckland. A small steering committee was set up from the Auckland branch of Red Cross and they set the fundraising process in motion. 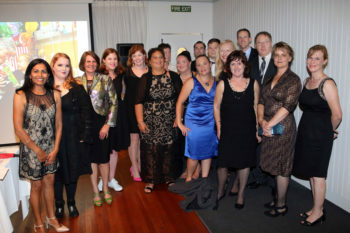 This team was lead by Deirdre Neville-White NZOM. Together they fundraised in many ways to raise the $89,000 needed to put a studio into the new Starship hospital. There were fun runs, floating the company on the Stock Exchange on the very last day of manual trading, and a radio-thon, to name but a few. During the two years prior to opening in Starship, a handful of volunteers were providing the Lollipop unique service of visiting children in the old Princess Marys Childrens Hospital. The official birthday for the Starship team, is the 15 April 1992, where it was gifted from the Red Cross to the children of New Zealand. When Radio Lollipop Starship was opened on the 15 April 1992, volunteers began working three nights per week. The team grew over the next years increasing to a fourth, then fifth night on the wards. They currently work Sunday through to Thursdays each week. Over the years volunteers have visited thousands of children and their families and we now have five branches here in New Zealand, with over 200 committed and enthusiastic volunteers The studio in Starship has moved twice since the first studio was opened. It currently is located in the very prominent position within the Atrium. The early teams initiated an Australasian conference where management team volunteers got together to discuss recruitment and training of volunteers, sharing ideas for fundraising, and working for the greater good of Radio Lollipop as new branches grew in each country. Other fundraisers over the years have included the Bella Dolls auctions, a John Lennon exhibition, Round the Bays fun run. Volunteers really get behind the fundraising and we have had several who have individually raised many thousands of dollars. One of our biggest supporters here in New Zealand is the Southern Stars Charitable Trust, who over the last sixteen years have raised over a million dollars for Radio Lollipop through the Kids in Show Seats (KISS) pantomime, they put on each year. Our very grateful thanks go to Keith and the team at Southern Stars. We celebrated this very significant birthday with a cocktail party that was attended by many inaugural volunteers and representatives from each branch and the volunteers from the current team. My biggest thanks though go to all the volunteers, some of whom have been with us for long time and are experienced in the art of entertaining children. Also too, my thanks go to the newest volunteers who come in to carry on the amazing work Radio Lollipop does it would not be the same without you and please know that the children and their families appreciate it very much.